This adventure occurred from June 11-13. I traveled to Austria this weekend. This was the first trip I’d taken which was to a place I had not been before. To be fair, I hadn’t been to Luxembourg, but that was just a day trip, so I don’t count that. And while I hadn’t been to Interlaken specifically, I’d been pretty close, and the Alps look pretty similar everywhere. I’d never been to Austria, ever. The trip started with an overnight train ride to Munich, followed by another train to Salzburg. The overnight train was entirely too long, especially since we’d been unable to get couchettes (little mini-beds) and were in a compartment in seats for the trip. We had 3 companions in the compartment, two Swedish girls and an Australian guy. They were pretty cool, but all in all I would have rather gotten a decent night’s sleep. Salzburg is an old city overlooked by an imposing fortress. Almost anywhere in the old city you can see the Hohensalzburg vigilantly standing guard. Inside the fortress there are several small museums, detailing centuries of Austrian military history. 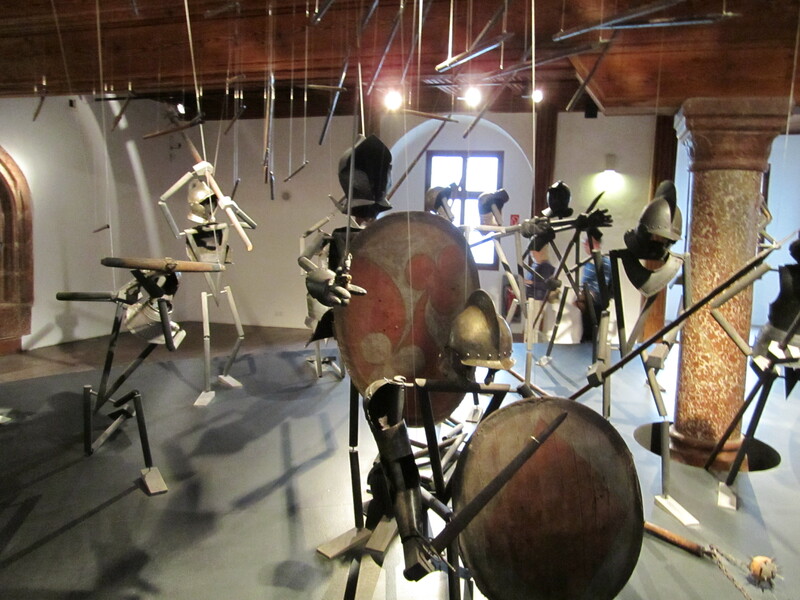 My favorite room had metal sculptures of men utilizing a variety of authentic medieval weapons. After the Hohensalzburg we visited both Mozart’s birthplace as well as his place of residence. They were really interesting (no pictures allowed *sadface*), especially if you’re in to music. My sister, who’s a fantastic and avid piano player, would have loved them. That evening, we ate at a pizzeria near our hotel, where I discovered that Salzburg is close enough to Germany to have Spezi! If you don’t know, Spezi is a DELICIOUS mixture of Coke and Fanta that is available more or less exclusively in Germany, where it is incredibly popular. I got turned on to the drink when I lived in Germany when I was younger, and let me just say that it was at least as good as I remembered. I’m not sure why it’s only available in Germany; I think everyone everywhere would like it! So I ordered a large Spezi, which is .4 liters. It should have cost 4.10 Euros (half the price of my pizza, yikes! ), but it was left off the bill! Best free drink ever! The next day, we visited some gardens in town (that’s actually where the first picture is taken from). 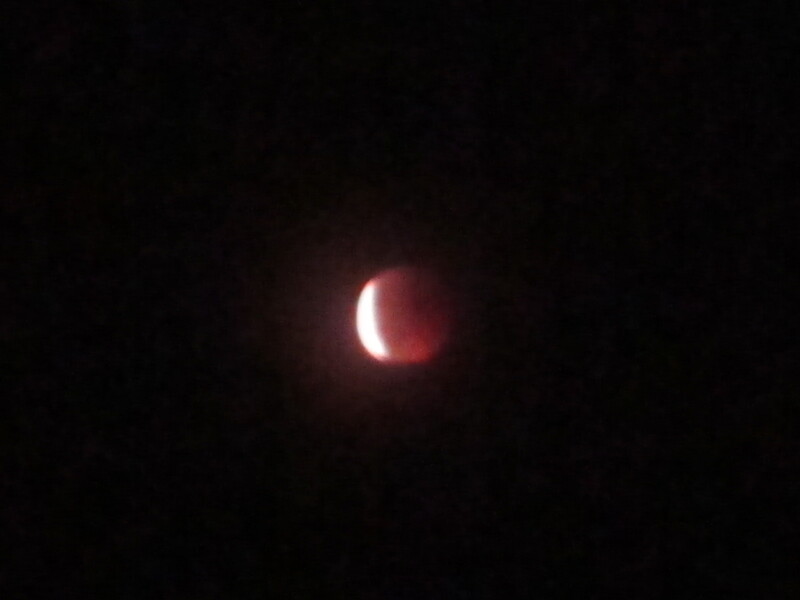 They were really pretty, although nothing compared to what was coming the next day. We also took a walk to the back side of the fortress, where there was a peaceful little lake and a palace we couldn’t get in to. 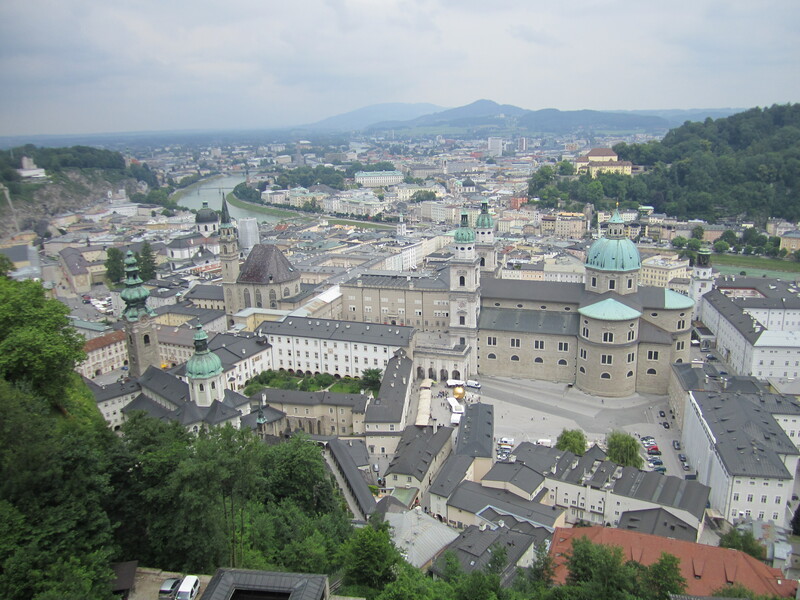 We left Salzburg in the early afternoon, headed to Vienna. Vienna has a much newer feel than Salzburg, and I didn’t like it quite as much; I’m a big fan of the Middle Ages, not so much of the Austro-Hungarian Empire time period. Vienna was, however, full of beautiful gardens and palaces, which we visited over the next day. We also saw a monument to the Soviet soldiers who liberated Vienna during World War II, which was very interesting, with writing in both German and Russian. Mozart’s grave was also in Vienna. I was expecting some sort of mausoleum there, but it was actually a fairly simple grave. Overall, Vienna was a really nice city, but not really my style. Hello everyone, it’s been a while. I’ve been pretty busy with tests and projects, so now I’m even more behind on these than I was before. Maybe I can get you all caught up this week. Let’s go! This is another “throwback” post; the events described occurred over the first four-day weekend (June 2-5). This weekend really could have gone better. 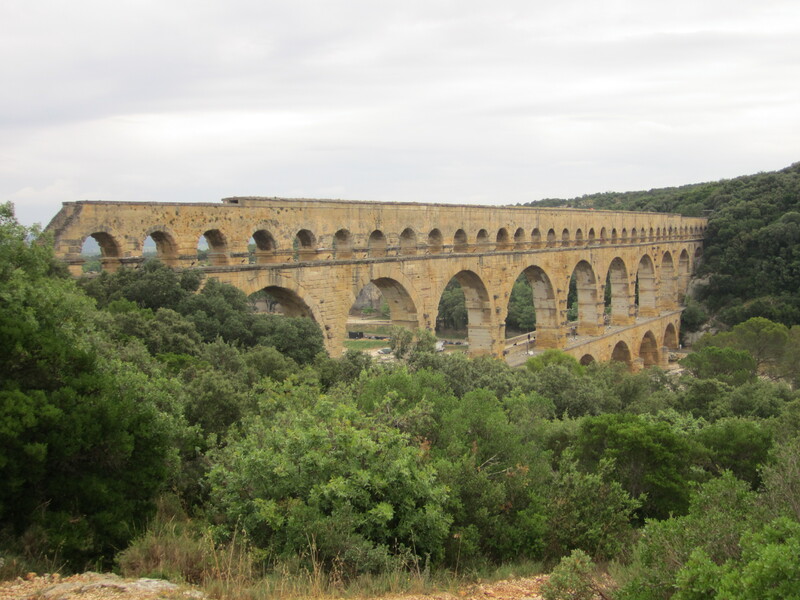 It started off on a bad foot: I managed to leave my Eurail pass in my dorm room. This means that I essentially no longer have a ticket to ride any trains, and any trains I ride I ride illegally. Lovely, right? I realized I didn’t have it as the train was leaving the Metz station, so there was not really any option to go back and get it. Fortunately the conductor on the first train (to Strasbourg) decided not to fine me for riding without a ticket after I told him I had one but forgot it (using his phone’s translation app: he didn’t speak English and I sure don’t speak French), and tickets didn’t get checked on the second train. When we got to Basel, I had long enough to purchase tickets for the remainder of the journey. If you ever travel using a rail pass, I strongly suggest not forgetting it: the tickets were about $200. Ouch! On top of all this unpleasantness, I was rather sick. I’d eaten some steak in the cafeteria that was less well done than I’m used to, and whether my stomach just didn’t like it or whether I got a mild case of E. coli I’m not really sure. The symptoms fit E. coli food poisoning, and it took about a week to clear up, as is typical for E. coli cases. And of course this was during the “DEADLY E. COLI OUTBREAK IN GERMANY” time, which was not reassuring at all. Despite all this, I had a pretty good weekend, since I was in Switzerland, the most beautiful country on Earth! 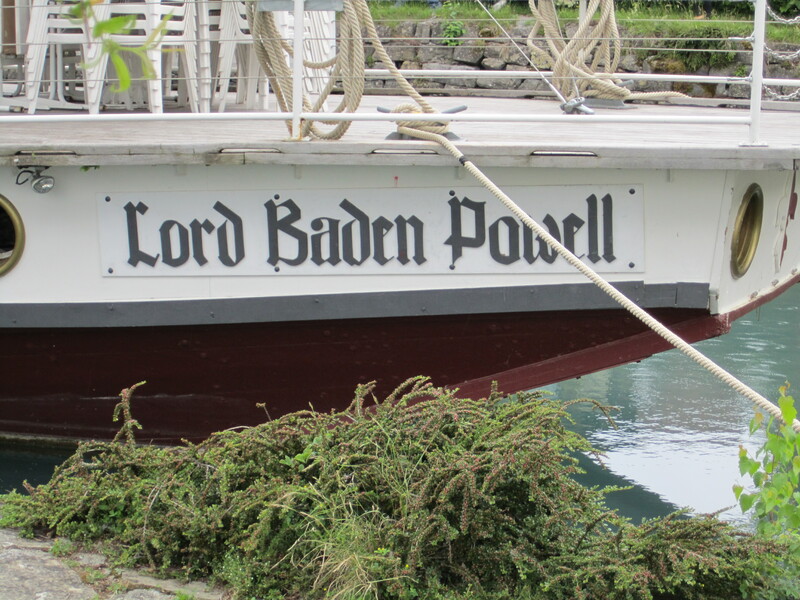 We stayed in Interlaken, a small, touristy town located, appropriately, between two lakes. We arrived in the early afternoon, checked into our hostel, and went for a short walk up a nearby hill. The hostel was pretty awesome. There were ten of us in one room, with bunk beds and a loft. It was like sleeping in a chalet. The next day was pretty bad for me. I woke up feeling far worse than I had yet, so I decided not to do any hiking. Instead I went to a pharmacy and got some imodium, which helped a ton. 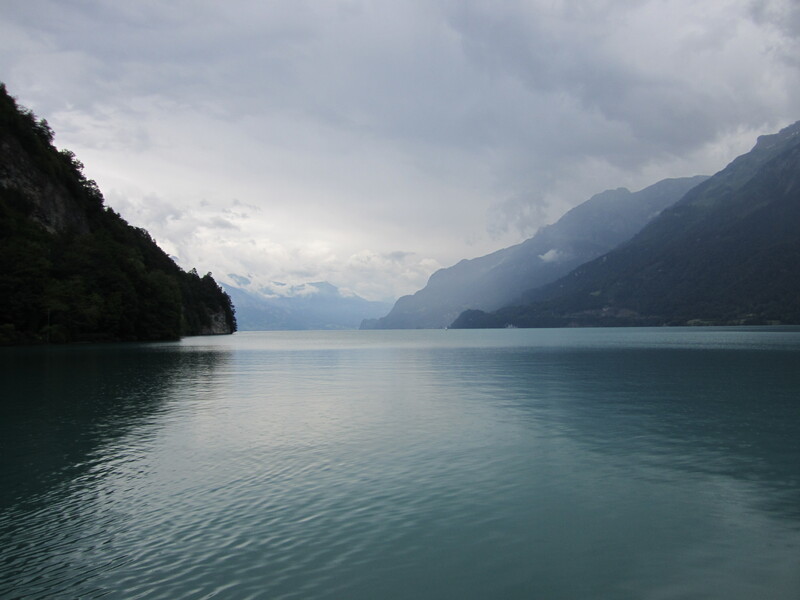 The next day we were headed back to France, but first we decided to walk over to one of Interlaken’s two lakes. Despite the cloudy, overcast weather, it was a pleasant walk along the river connecting the lakes. We ultimately made it to the lake, where we sat on a dock looking out over the lake for a while. The train ride home was thankfully uneventful, especially compared to the one to Switzerland. I also soon overcame my sickness, possibly due to eating basically nothing for about 24 hours. Overall, the weekend could have been better, but of all the places to be ill, Switzerland is near the top of my list. So that’s not exactly what the sign says, but I like the Lord of the Rings translation better than “Stop, this is the empire of Death,” although that sounds pretty awesome too. I really feel as if J.R.R. 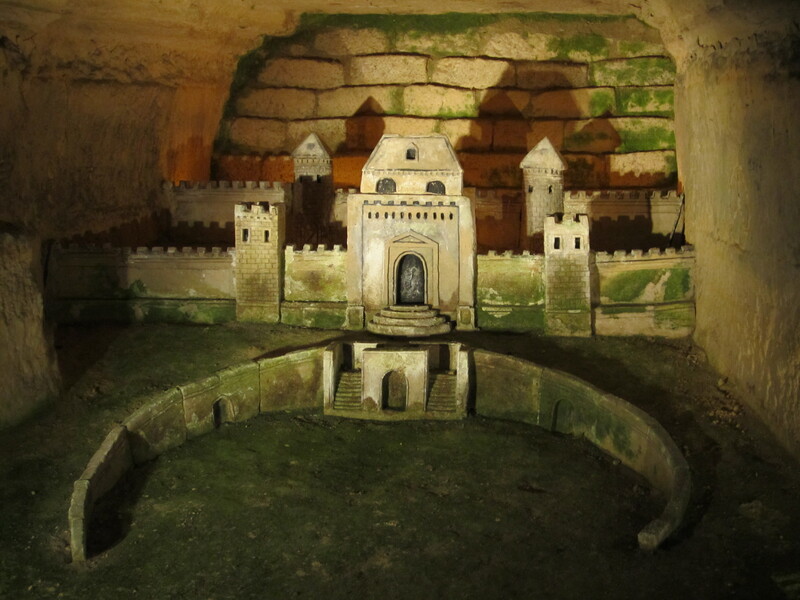 Tolkien must have visited the Paris Catacombs at some point and used them as inspiration for the entrance to the Paths of the Dead. Or at least Peter Jackson did and used it for the movie adaptation. The resemblance truly is eerie. Finally you get to a fairly large chamber, and over the next door is the sign you saw above. Pass through the door and you enter the ossuary itself, where lie the remains of millions of Parisians (Wikipedia says 6 million, I’ve heard 7.5 million, either way A LOT of bones). The bones are arranged in neat, orderly rows, and go on seemingly forever. For a good half hour you walk through these old mine tunnels with the walls lined in human bones. And there’s nothing to stop you from touching them (don’t, though. The French people who work there don’t like that. You can’t use flash either, so turn up the ISO on your camera). The entire experience is very surreal and macabre, but completely awesome. For me, this was hands down the coolest place I’ve been so far. I honestly think Charles Martel is one of the coolest guys in French history. When your name is literally “Charles the Hammer,” you must be pretty awesome, right? The Pope offered him the title of Consul (historically one of the two leaders of the Roman Republic) and he said “thanks but no thanks.” He was a brilliant general, stopping the Muslim expansion into Europe, which had gone on unchecked for 20-odd years, more or less conquering the Iberian peninsula, at the Battle of Tours. 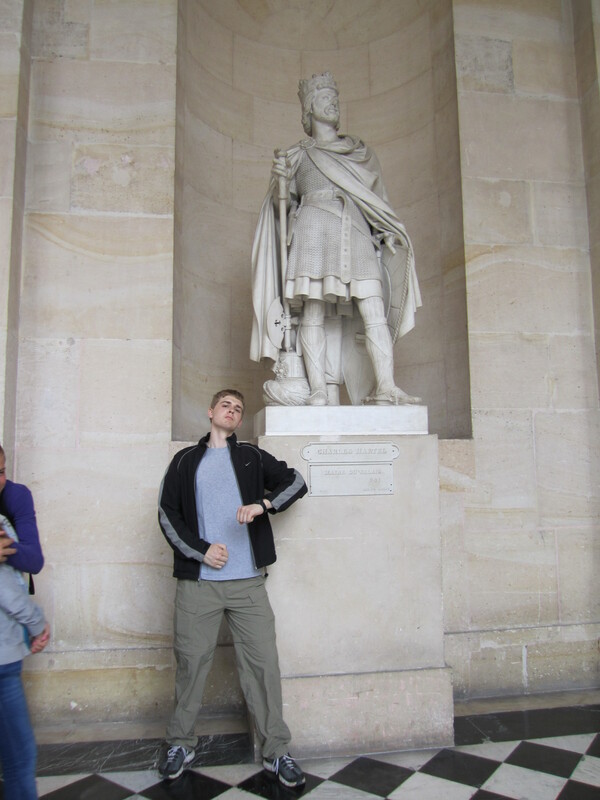 And apparently the whole “awesome leader-general” thing was genetic: you might have heard of his grandson, Charlemagne. On Saturday I did the Louvre, Notre Dame, and Sainte Chapelle, with the Eiffel Tower that night. Seeing Paris lit up at night from 1000 feet up was pretty impressive, but I really don’t like the elevator to the top. 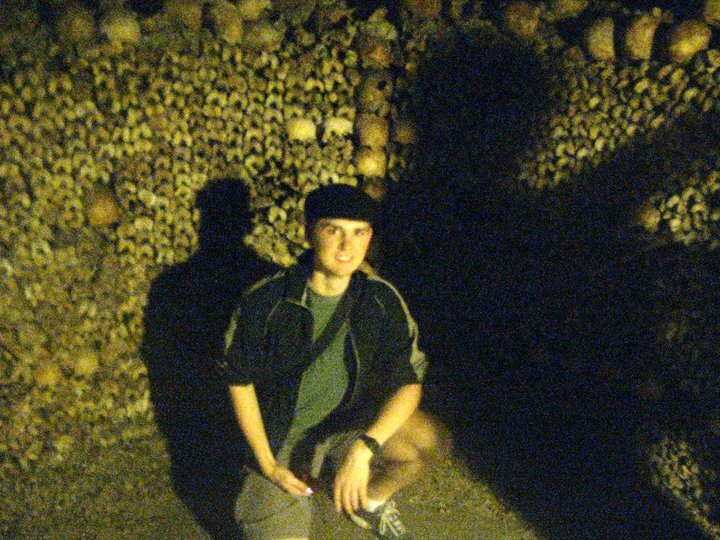 I also bought a pretty cool hat, which you can see in the picture of me in the Catacombs. On Sunday we visited Montmartre and the Basilica of the Sacré Cœur, as well as saw the Catacombs. I personally found Sacré Cœur to be much more impressive than Notre Dame. The style is more reminiscent of many Italian or Byzantine churches than Gothic European cathedrals. It almost looks like a mosque from a distance. Also, the view from the dome is fantastic. Montmartre is a fairly significant hill overlooking the city to begin with, and Sacré Cœur is pretty dang tall. The wait to get to the top is also much less (read: non-existent) compared to the hour-plus wait to climb the Notre Dame tower (and I think it costs less as well). Well, that’s about it for this weekend. 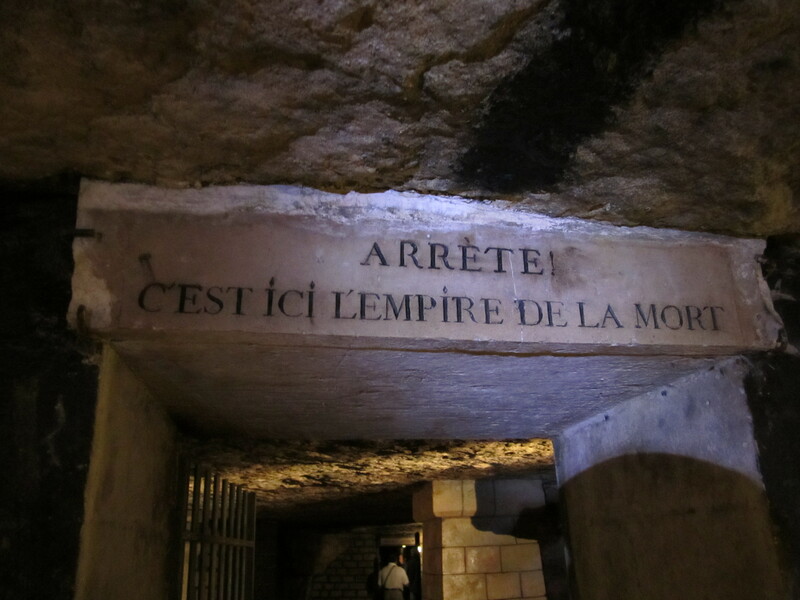 Paris was great, and if you go you should definitely visit the Catacombs. Just remember, if you’re quiet, you might pass unnoticed by the Balrog. If not, make for the Bridge of Khazad-dûm! First, a quick explanation: this post is actually about a trip that happened several weeks ago. I will be going back and adding posts for all my trips up until now, and from now on I’ll try to keep this updated on a weekly basis. And to answer the title question, yes, apparently so. I arrived in Metz on Monday, May 16 after a lovely flight from Charlotte International Airport and a not-so-lovely bus ride from Frankfurt International. The aforementioned bus ride was plagued by technical issues. First we hit something trying to get out of a rather tight parallel parking spot. Then, after about 20 minutes, the bus basically died, on the Autobahn, no less. All the radiator fluid was gone. The driver called for a new bus and we sat there for a while, until he realized he could refill the radiator. He did so, finishing the job right as the new bus arrived. Rather than transfer to the new bus which we knew would be fine to get us to Metz, we stayed with the one which might or might not have been leaking from the radiator all over the highway, and which might die again in another 20 minutes. 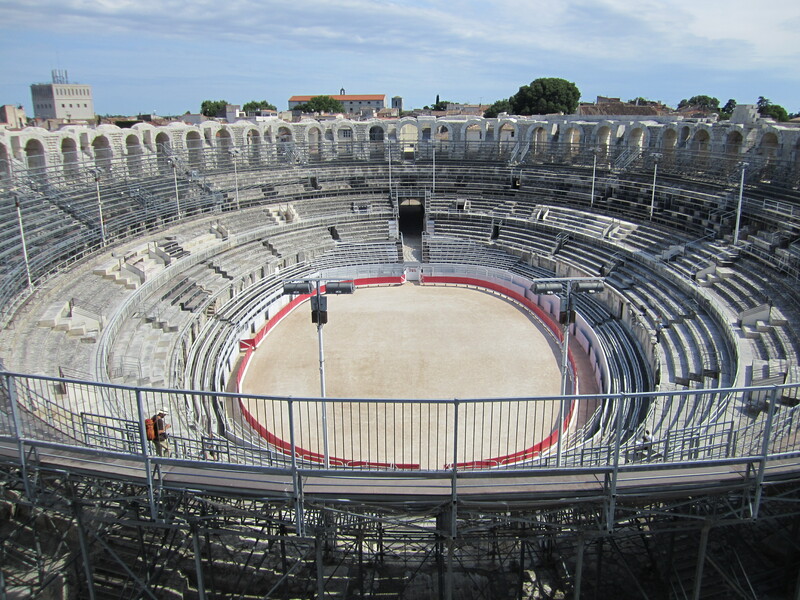 Fortunately it didn’t and the rest of the trip to Metz was uneventful. 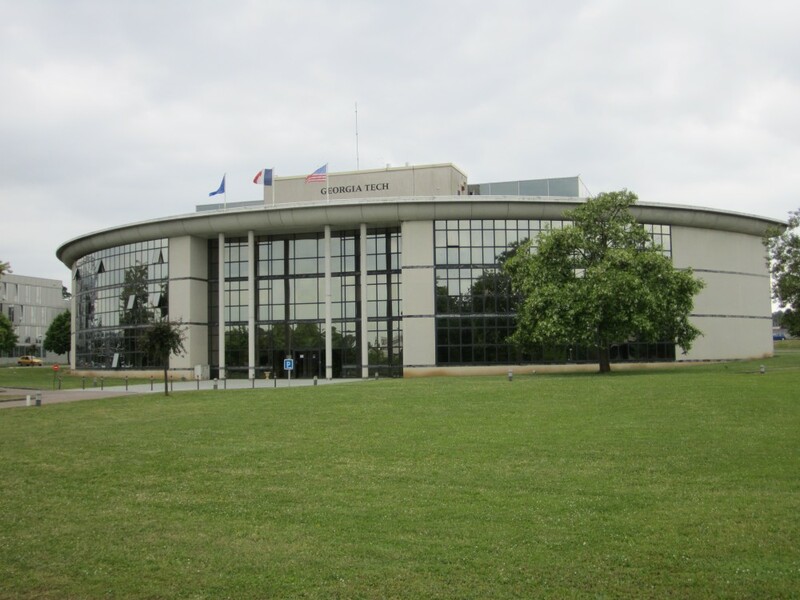 GTL is located in an area called the Metz Technopôle, which contains a large number of schools, both college- and high school-level. For being in an area with so many academic buildings, the GTL building looks the most like what you would expect to see on a college campus, at least on an American one. We had an orientation to Metz and GTL on Tuesday, which was actually pretty useful, particularly in the case of finding the nearby grocery stores, Simply (a smaller store, similar to a Publix or Kroger) and Cora (a “hypermarket” where they sell more or less everything you need and some things you don’t, similar to a Super Walmart or Super Target). Classes started on Wednesday. I won’t bore you with the details of the mechanics of deformable bodies, or of crystalline structures in metals, but I will say that the pace of summer classes can catch you off guard if you’re not prepared for it. Most classes meet every day, unlike ones during a normal semester, so there’s no “off day” to catch up. You have to keep up or fall behind. This has been particularly difficult for me as I was on co-op rotation last semester. It’s surprisingly easy to forget that when you’re in school, your work doesn’t end when classes do. But enough about that. You’re not here to read about classes, you want to hear about travelling, right? The first weekend was a two-day weekend. If you don’t know, here at GTL the weekends are of varying lengths. I believe in the past every weekend was a three-day weekend, but now the lengths vary to allow for some longer trips. There are two 3-day weekends, two 4-days, and one 5-day “break” in the middle. The remaining weekends are two days long. 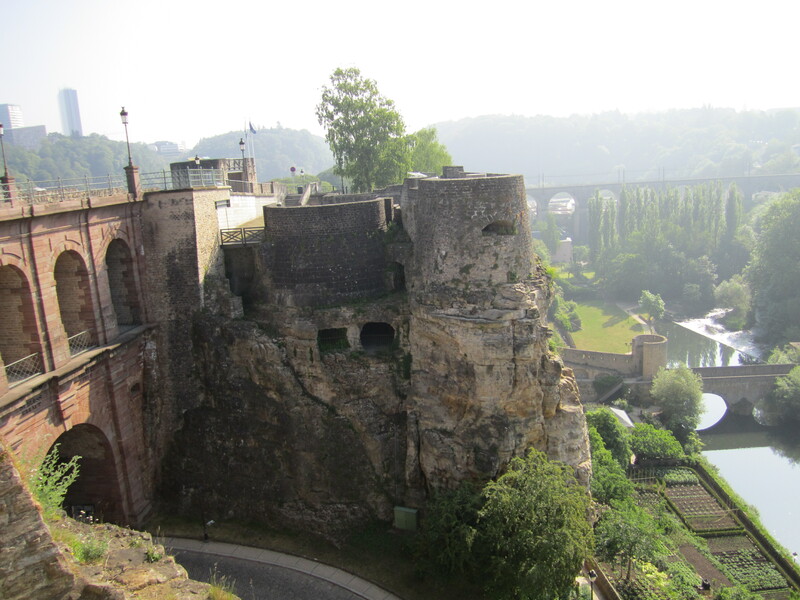 You can see the outside passage between sections of the casemates on the left of the picture (looks like an aqueduct). After doing some walking around the city, we rode a bus almost to the end of the line and walked about a kilometer to the American cemetery there. It’s the largest one in Europe, where many of the casualties of the Battle of the Bulge are buried. General George S. Patton was not killed in the battle, but is also buried there. In addition to the graves, there is a memorial to those who died in World War II and maps showing the fronts of the war. 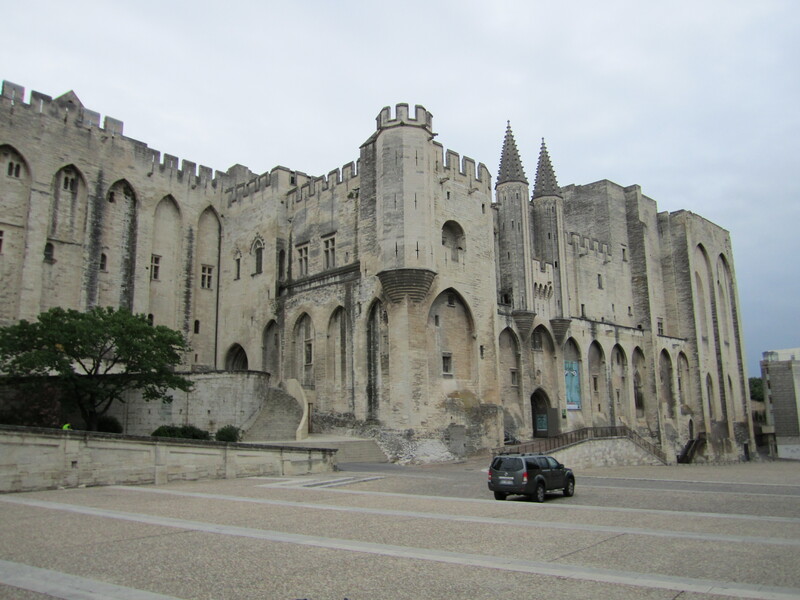 This was a very stark and moving reminder that not all of Europe is ancient castles and pretty palaces. Millions of soldiers have died here in the past hundred years, and while it is not always comfortable or pleasant to be reminded of that, it is something that should never be forgotten. That’s about it for my first week in Europe. Stay tuned for more adventures as I take on Europe, one weekend at a time!